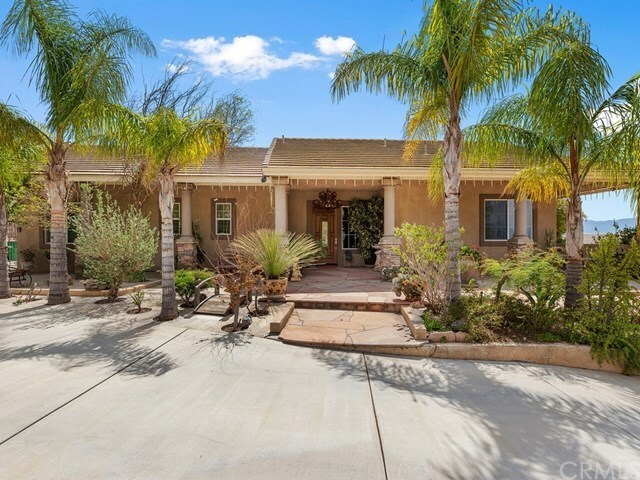 Must see this beautiful Wild Horse Estates single story home. No Mello Roos!! This 5 bedroom 3.5 bath home has upgraded kitchen & bathrooms with granite, custom upgraded arched doorways thru out house, high ceilings, crown molding and large open family room. There are two master suites. The large master suite has a large walk in closet and fireplace. Beautiful salt water pool and jacuzzi with views of the city lights and hills. The outdoor living space has a fireplace and outdoor kitchen. The driveway was constructed so you can drive around the entire property. Two automatic gates secure the back yard. If you love gardening there are over 27 varieties of fruits trees planted around property. This house also has solar.